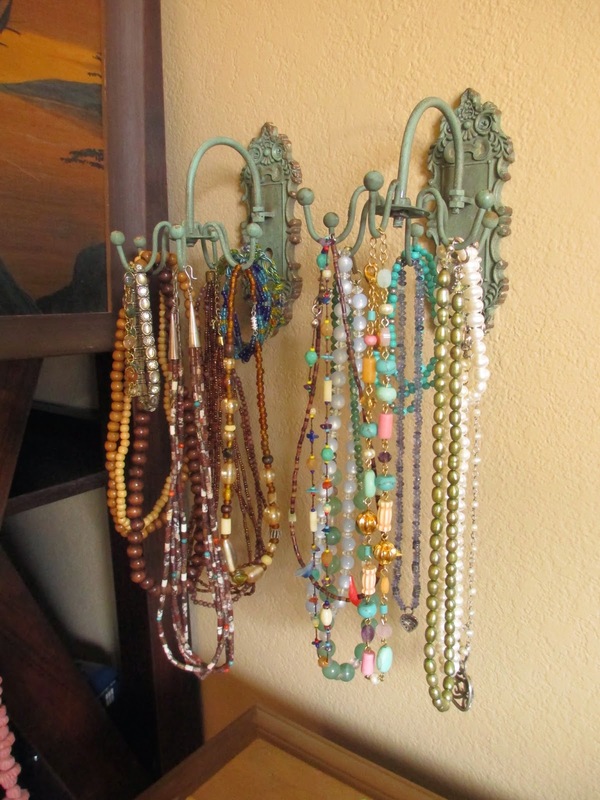 1) Jewelry Hangers - I wasn't exactly planning to get anything new for my jewelry, but a couple of items were starting to get cramped and these hangers from Hobby Lobby were in the perfect shade of green. I maybe have them overstuffed with necklaces and bracelets--they'd look prettier with less, perhaps, but they're more functional this way. I have mainly the beaded necklaces up because they're the ones that tend to take up more space in drawers. 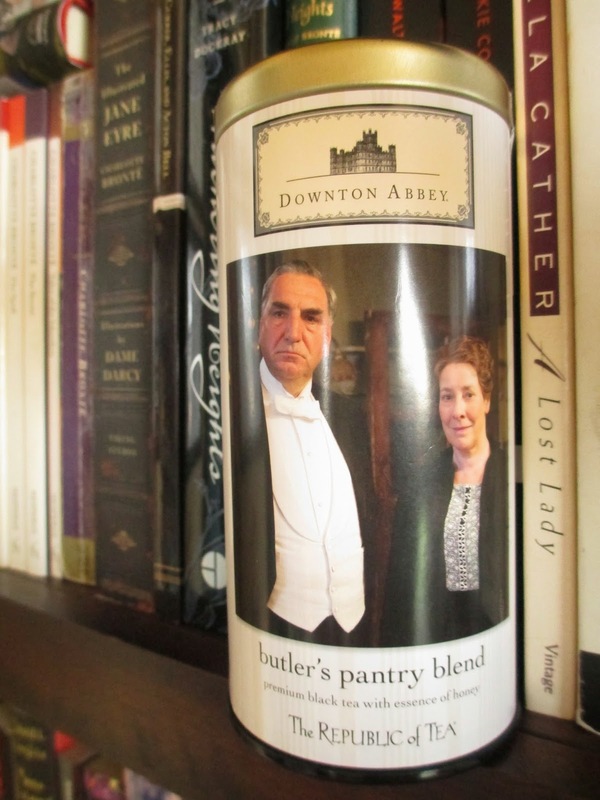 2) Downton Abbey Butler's Pantry Blend Tea - This is the fifth flavor I've had, right? It's black tea with blackberry leaves, honey, and vanilla. So it tastes like a strong black tea with an in-depth immersion of honey. 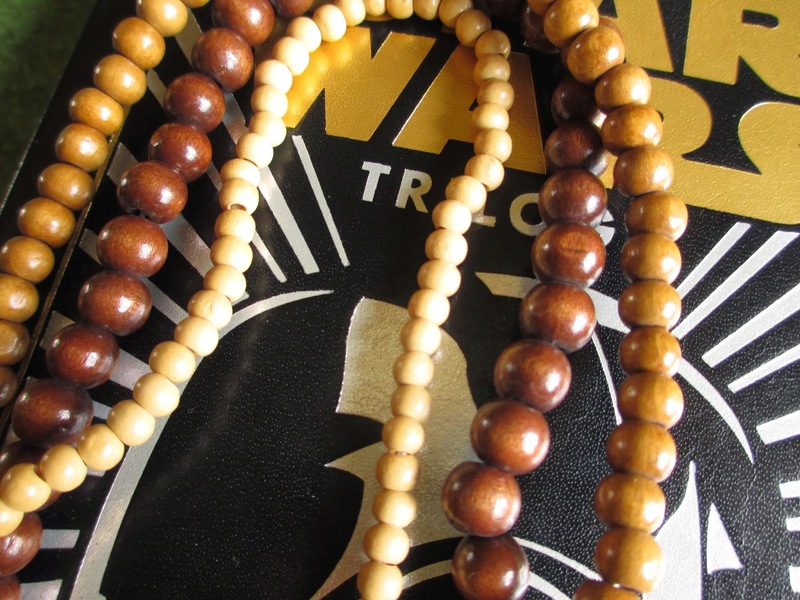 3) Wooden Necklaces - Someone recently gave me a few necklaces, among them these three with wooden beads. I really like the simplicity with the warm wood tones--I think they might be great for layering together or separately with other kinds of jewelry. They'll add a little texture and organic feel to outfits, which should be especially nice once the summer weather starts working in. 4) Double Chocolate Brownies Recipe - Click here for this recipe from Martha Stewart. It's fabulous and I highly recommend it--it's ever so much better than the other brownie recipe I tried out (which just used cocoa powder instead of also adding in the melted chocolate). It's fairly simple and because you're using chocolate, the kind of chocolate you use gives you direct power over the flavor. Do you want darker brownies with more depth, or something simpler? I've made them twice, each time with a different blend of (leftover) chocolate bars, so they tasted a little different each time. They're great: they have that harder layer on the outside and a wonderfully chewy sort of softer center. 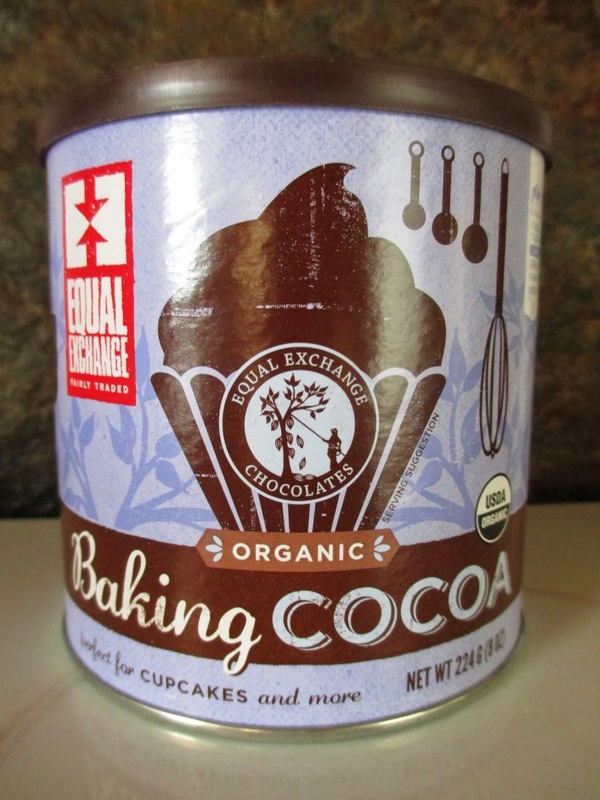 Since I don't have a picture of the brownies, here's the cocoa powder I used; it's from Equal Exchange. 5) Pair of Cameos - More gifts. These are pins, not necklaces, although maybe I wouldn't be opposed to making them into necklaces; I don't know, I'll have to think about it. They're simple but have a pretty different look to the cameos I already have--the colors and materials are different, giving maybe a more modern look. I'm picturing them with black and white type outfits. 6) Wooden Pen - Okay, so it isn't that I love products with my name on them--it's just that it's literally been years since I found one with my name. Actually, I think I've only found my name in two places: a gas station in California (this must've been 15 to 18 years ago) and a tourist shop in a cute little historical town (maybe 12-15 years ago). This pen was from the Desert Botanical Garden in Phoenix. So, you know, I had to get it--and it's kind of nice that it's wood. I like wood. 7) Green Skirt - This might be the first clothing piece I've bought from ModCloth (minus a bathing suit). I don't really buy clothing online, but I was stalking this skirt for a while. It's the Bugle Joy Skirt in Olive. I love the color and I think the skirt is really pretty and so even though I'll hardly ever have anywhere to wear it (people don't tend to wear things like this in Arizona), I couldn't resist. Though the skirt is A-line, it doesn't look as full when it's on as it does in the picture; the color is also less gray. 8) Oaxacan Bird - Also at the Botanical Garden, they had a collection of these Oaxacan animals. Since I had started my collection of green ones with only two, I took the opportunity to get one more--three makes for a better set. 9) Soft-Boiled Eggs - Technically, perhaps, I've been making raw hard-boiled eggs. I like them best when the yolk is just barely becoming solid, though soft-boiled eggs are supposed to be more free-flowing than that. 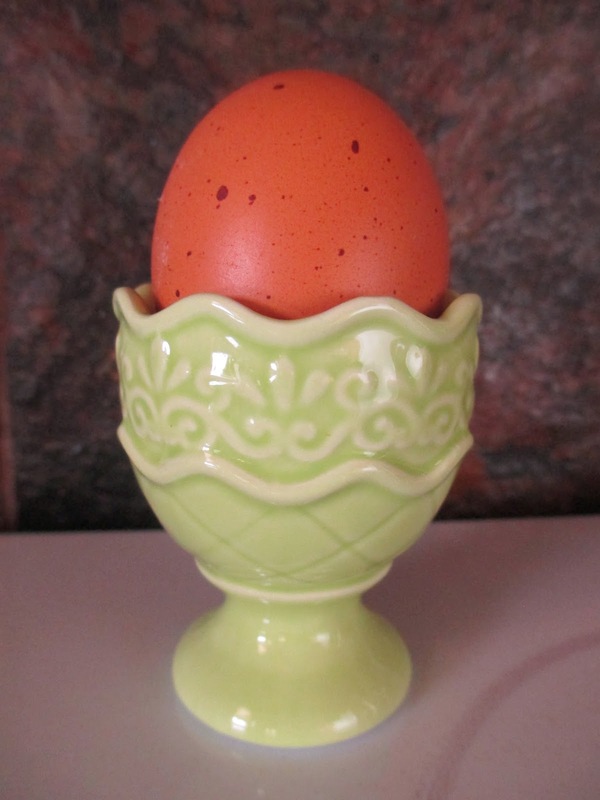 The egg cup is from Hobby Lobby. 10) "Beating Heart" by Ellie Goulding - You know that I've been a little obsessed with Divergent for the past couple of weeks. When this song played in the credits, I loved how it captured the feeling of the movie. Then I kind of started to like it just on its own; I've been listening to it a lot. I'm a little out of the popular music scene: I don't really listen to the radio, so mostly I'll hear songs in random places (like stores). I'd heard Ellie Goulding's name, but wouldn't have been able to name any of her songs. Now I'm rather intrigued by her style, that atmospheric quality and her very-alive vocals. It's been too long since I had any Theo chocolate. 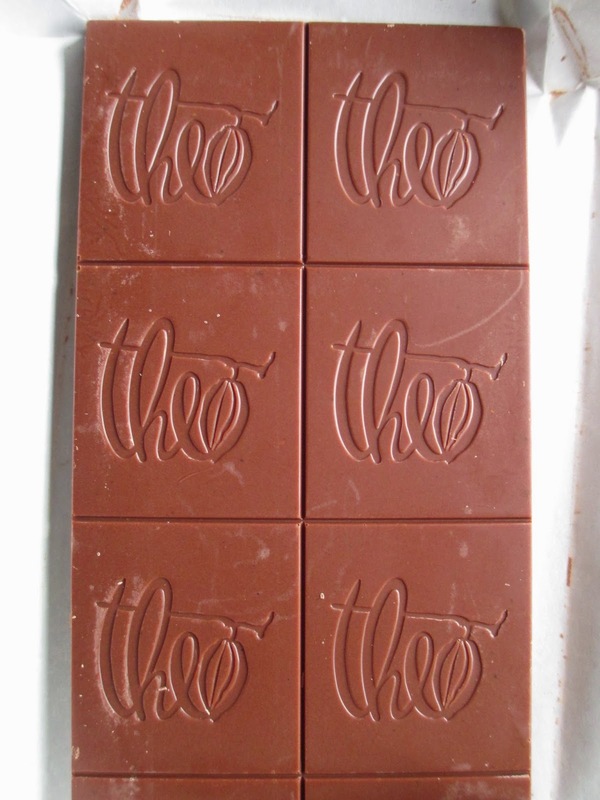 I hadn't realized how much I'd missed their products until I unwrapped this bar and delighted in its markings (really, doesn't Theo have a great logo?) and then in its specific flavor. This is their Congo Coffee & Cream milk chocolate, which comes in a nice and solid 45% cacao. I love a deep milk chocolate. As you can see from the bar's wrapper, this chocolate was made with coffee from Eastern Congo; a portion of sales also goes to the Eastern Congo Initiative. All the ingredients are organic and everything except for the milk powder is marked as fair trade. And there are, of course, only a few ingredients. So now that we have all the ethics and quality down, let's move on to taste. It's called a Coffee & Cream bar, which implies something sweet and milky, despite the high (for milk chocolate) cocoa content. But remember, Theo is the one who does that lovely Creamy Milk Chocolate bar, which also happens to be 45%. I love that bar and it's one of my favorite, easily-accessible chocolates to share with other people. So the Coffee & Cream, it would seem, uses the same chocolate, just with the addition of coffee. The resulting flavor is like a perfect cafe mocha (you know, coffee with chocolate in it). The chocolate is rich and warm without a hint of darkness, very creamy and yet not very sweet. The coffee, well, it's in those fine pieces; maybe it isn't so fine as ground coffee, but it's close enough that if you let the chocolate melt away, you'll be left with strange coffee grains in your mouth. So I would recommend more of a chewing approach; that'll also be the best way to blend the coffee flavor with the chocolate. It's quite something to take an existing idea (creamy, rich milk chocolate) and combine it successfully with another flavor. Everything balances together. Because it's a milk chocolate, this bar is like a semi-sophisticated confection (I don't, however, mean that it's mediocre confection quality). It has enough milky and sugar flavors to remind you of candy chocolate, but then it has that edge of richness from the higher cocoa content and the darker flavor of the coffee. So it satisfies a few different kinds of cravings at once. Well done, Theo. I'm happy. 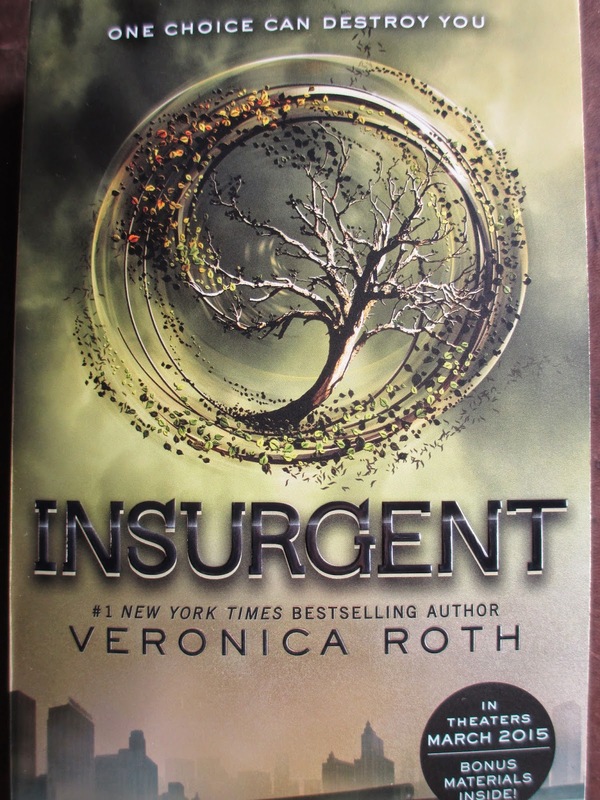 It's possibly unnecessary to do a post on this book (and I promise that I'll be resting on Divergent posts after this), since it is just a collection of four prequel stories and three short, additional scenes. But I posted on Gayle Forman's Just One Night (which finishes up after Just One Day and Just One Year). And come to think of it (though I hate directly comparing things), Four gives more to talk about than Just One Night did (it was basically the epilogue for the other two books). Four is more like the almost-book that I hate to mention out loud--Midnight Sun. Except while Midnight Sun was designed to cover all the space of Twilight (from Edward's perspective instead of Bella's), Four (from Tobias's perspective instead of Tris's) only tells some of the moments from Divergent--much of it is from before that book starts and the narrative is told in pieces with gaps in between. It's really a book of extras, not an additional book--and that was the way I thought of it before reading, so I can't say I was disappointed. (Though I'm not sure why the knife-throwing scene wasn't included--I had to get the digital version of that one.) I kept thinking in my mind that Allegiant was the last book, and Four was just a little something to flip through afterwards. But, you know, it worked very well to have this little book to "flip through afterwards." 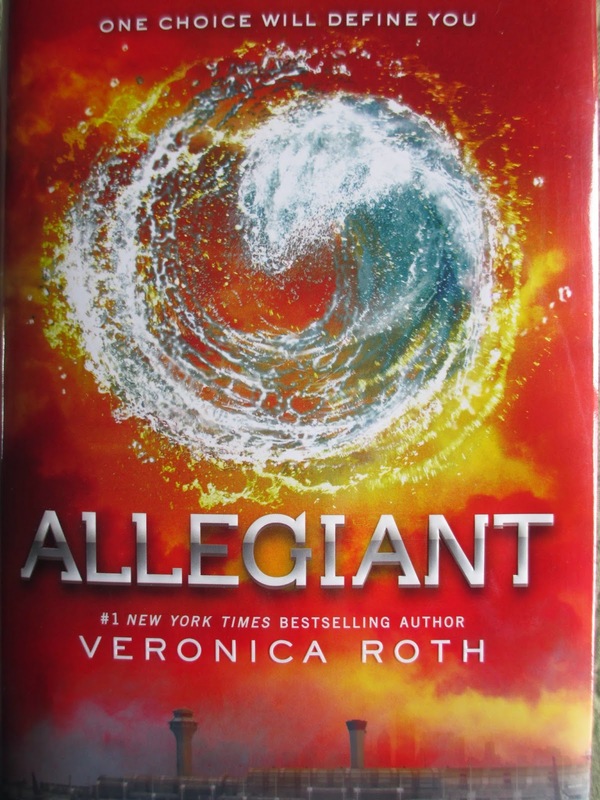 I've already explained how much I liked the way Allegiant ended--and how much I enjoy looking back at the good moments throughout the trilogy, especially from the first book. So it was satisfying, as a reader, to finish the trilogy and have it come to a complete ending, but then be able to take one last look (in a slightly different way) at the beginning. Tobias, throughout the trilogy, emerges as an interesting character. Tris is there to find her strength and become herself; that's why it makes sense for her to shorten her name and stick with the shortened name. Tobias, however, is fleeing from his past and needs to make sense of who he has been and reconcile it with who he is trying to be before he can really be comfortable with himself and his decisions. So his journey is different from Tris's. And it's nice, just as an extra, to see where he began and what he was thinking at certain key points during Divergent. While these stories aren't all about finding out new things, there are several new tidbits that enhance the story or are just fun to find out. I'm kind of sad now that I'm done (well, except for the movie companion--does that count? ), but I am also satisfied by my time spent in this universe. To What Are You Allegiant? If you've been reading on here for a while, you'll know that I really appreciate it when fiction (whether we're talking of books or movies) sets out with a specific purpose. It usually bothers me when a series goes on just for the sake of going on, not because the story is specifically designed to continue for a certain amount of installments. But with Divergent, Veronica Roth created a complete trilogy that sets out with a certain story to tell that is told just right in three pieces. This story also rose up with one of the best themes I've read in a while, expressed so powerfully that I love this last book for it. There will be some spoilers in this post. I'm trying to just let myself read these books quickly so that I can be free from their tight grip on me--I keep thinking of these characters, this world, the factions, the movement, the pacing, the images. It's great, on one hand, for a book to have a big impact--but it's also pretty hard when you still have your daily life to continue and that doesn't include sitting around all day reading or thinking about books. Well, I was supposed to be posting on the last Hobbit: Chronicles book, but when I was coming close to finishing it, I set it down and picked up Divergent instead and didn't go back until I'd finished the latter book. If you haven't read my thoughts on the movie from a couple of days ago (you can read those here), read them first because I'm going to build on everything I said there. As a literature person, I would rather say that I read a book before watching a movie--and that is usually the case (except where I only watch the movie, because I'm not interested in reading the book at all). But in the cases where I've gone in the reverse order, I have found that it can often be better: you can more clearly see what the movie does have to offer without being distracted by minor things that are different from the book. If, however, the book is mediocre, the fact that you know where the plot is going will make reading it feel boring and redundant. Maybe that's part of the reason why I hesitated to read Divergent. I really enjoyed the movie, and I knew that if I didn't also enjoy the book, reading it would lessen my positive feelings toward the movie. That, however, was not the case. Despite how close (in general) the movie was to the book, I still hated to put this book down and kept thinking about it while I was doing other things. I knew what was going to happen, so it wasn't suspense: I was just enjoying it. I had said that the movie didn't feel as much like dystopia to me, and now I see why. This story isn't completely dystopia. I really like what Veronica Roth said in the back of the book about dystopia and utopia, about how fiction must have conflict and about how you can't really create a utopia in the first place. I remember reading Plato's The Republic in college and picking on how unrealistic his plan of the perfect society was--that's the kind of concept Veronica Roth is referring to. And so if you take what she said, about how the world of Divergent is a society that was originally built on ideals but has become corrupt because that's just what happens with flawed humanity, then you arrive at a concept that I find rather separate from dystopia. This world isn't (the way I see it) about the corrupt and oppressive government: it's about people. And people stray and wander and make bad choices and sometimes that can lead everyone to dark places--but that's why it's important that they find a way (often from the guidance of others) to get back into making good choices. I was surprised, when I began reading, at how young Tris's voice sounded. I realized that she was probably a bit younger than she looks in the movie, but in the first stage of the book she reads more like a child than a teenager. And that's part of the story and the theme. She starts as a child, feeling out of place and trying to do what she is told. By making a choice that is for herself alone, she begins the path toward growing up. She is doing what everyone must do in life: creating herself, deciding who she wants to be and then working to become that, whether or not it is easy. It's a very clear portrayal of coming of age. The society, the factions, the government, and the rebellion, they're all just details, the setting of the story (I don't mean to downplay the details: I think there is some very interesting commentary surrounding the factions and what they each aspire to be). I enjoyed watching Tris's journey again, and I still enjoyed watching all of the characters. I was listening to music earlier and "I Believe My Heart" (from an Andrew Lloyd Webber musical I've, of course, never seen--I have the version of the song that's on Keedie's album, which is named after the song) came on; I named it Tris and Four's song, though it's maybe a tad sweet for them. By the way, I'm also delighted to find that many of the songs on Veronica Roth's playlist for the book are from Flyleaf: you know how much I love Flyleaf and their lyrics. In fact, I'd say most of their songs fit this book pretty well--and maybe the reasons why they fit so well are also the reasons why I still like this story. I don't know how much I like it. I've observed that it usually takes about a year from your last exposure to a story (whether it's the last book you'll read or the last movie you'll see in the series) to really see how much you like it. Some things are more temporary than others. Some fade more; some linger. So I can't speak to any of that. I'll just say, for now, that I'm enjoying this story. Tolkien created a wonderful thing in Middle-earth. He created a world so complete in every detail of mythology, history, culture, art, and geography. The different peoples he created differ from each other in just the right ways and are also so distinctly apart from our own world, even where there are parallels. Lately I've been noticing a certain duplicity in most of the Middle-earth cultures that is interesting to consider. I call it beauty and battle. Most of the cultures of Middle-earth (at least, the ones that you would consider to be "cultures," not orcs or goblins or such) value beauty, though they each have their own ideas about what beauty is. The elves love trees and harmony with nature, flowing lines and radiant colors. The dwarves value the precious stones they mine from within the earth and the vast cities they carve out of stone. Men differ, depending on region and time period, but whether we're speaking of Númenor or Rohan or Gondor, they all have a certain adherence to style and form. Architecture as a form of art and a specific type of raiment, whether for daily use or for important or ceremonial positions, is important to all of these cultures. It makes them seem very high that they value beauty and art so much. But they are also peoples of war. The elves have a complicated history with war. Some of them fought with each other, some of them only fought the evil foes, and some of them try and stay out of it all except when they have no choice. But elves are good at battle. Dwarves are pretty good, too, and they tend to value their warrior status pretty highly, too. Men, I think, are warriors more out of necessity. The men of Gondor (and Aragorn's scattered people) value many other things besides war but fight because there are foes, and so they try to make themselves good at war so that they will not lose. They are not savages, but still they fight. Beauty and battle. The highest, aesthetic appreciation and the most base of actions. Beauty and battle. Do they fight to protect beauty, or do they create beauty because they must also fight? What is beautiful (and here I speak of more than just architecture) is worth protecting, and when one is forced to take part in war one likes to have something beautiful to think of and remember. Beauty and battle--they are both intelligent and efficient and they both have a profound impact on people's lives. I watched Divergent. And I liked it. So I watched it again a couple days later. And I still like it. 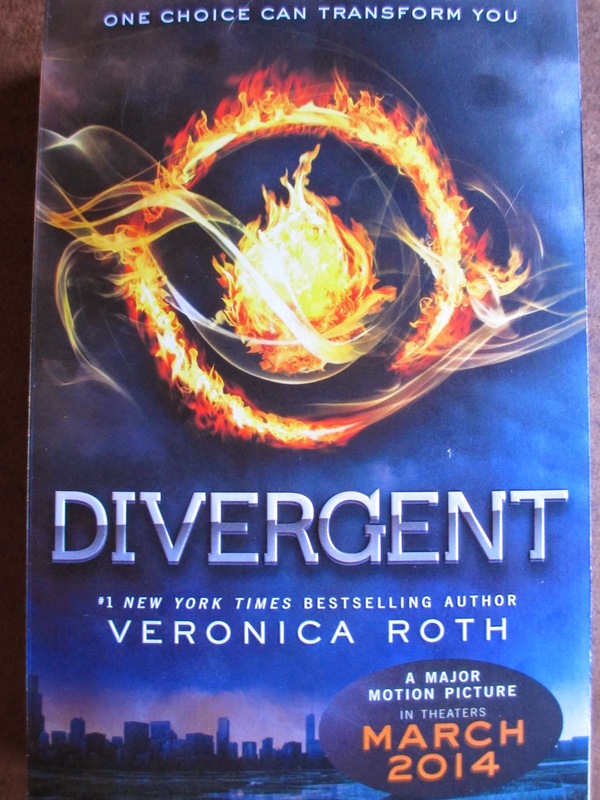 Like so many other books, I've been hearing about the Divergent series and Veronica Roth for years. I knew the very basic premise, though I'm not even sure where exactly I heard about it (wait, no, I think it was on Kayley Hyde's book channel on Youtube two or three years ago). But it never interested me. I only watched the movie because I'd been working hard during the day and wanted to just sit and watch a movie, so why not this one. And then I liked it. I just enjoyed watching it, was kind of sorry when it ended, and kept thinking about it afterward. I have so much that I want to talk about as relates to this movie that I'm going to have to divide it all into sections. I. Why I hesitated to say I liked the movie. Why, though, was I almost ashamed to admit that I'd liked it? Why, though I felt like I would really want to read the books, did I feel like I wouldn't want to walk into a bookstore and buy them? Why is that? It has to do with two things. The first is the fact that it's YA. I'm years away from my teens now, so I don't exactly want teen fiction to take up too much space in what I'm reading--I've nothing against reading a variety of age groups (I can't wait to read Gayle Forman's new book, and Mrs. Frisby and the Rats of NIMH is probably still one of my favorite books), but sometimes I hesitate with the YA. It's been so popular lately that I kind of feel like it's easy to miss out on other things, other perspectives, and other themes by leaning too heavily into YA. The other reason why is that I hesitate to get into things that are already popular. I know that this is terrible, just as bad as not getting into things that aren't popular. But when you pride yourself on enjoying things that you have specifically connected with without anyone else telling you to like them, it's hard to so easily take a popular recommendation. I'd been hearing about Divergent for so long that it didn't feel like anything that I would be able to make a personal connection with anymore: so many other people had already made it their own that what could it have left for me? But the thing is, despite all of this, I did make a personal connection with this story--and it would have been a shame for me to miss out on that. II. Why I liked the movie. In the first stages, I was thinking of it as an action movie for the female mind. Please don't think I'm being simplistic or backward here: I know that male or female has nothing to do with what kind of movie you like, whether you like more action or drama or this or that. But we do generically refer to certain action movies as guy movies, in the same way that there are chick flicks. (For the record, I don't usually like either one.) Divergent was like an action movie that I could enjoy. It was exciting because, whatever was happening, I always felt like I was in Tris's mind. When everyone is getting ready to jump from the train for the first time, you're feeling her adrenaline and her desire to fit in with this new crowd that she's admired and to start her new life here despite any fear she still has from her old life. I feel like there sometimes wasn't much dialogue and yet I could hear so many of the characters' thoughts. The characters are all alive, and they're all people I wanted to keep watching and learn about and see. 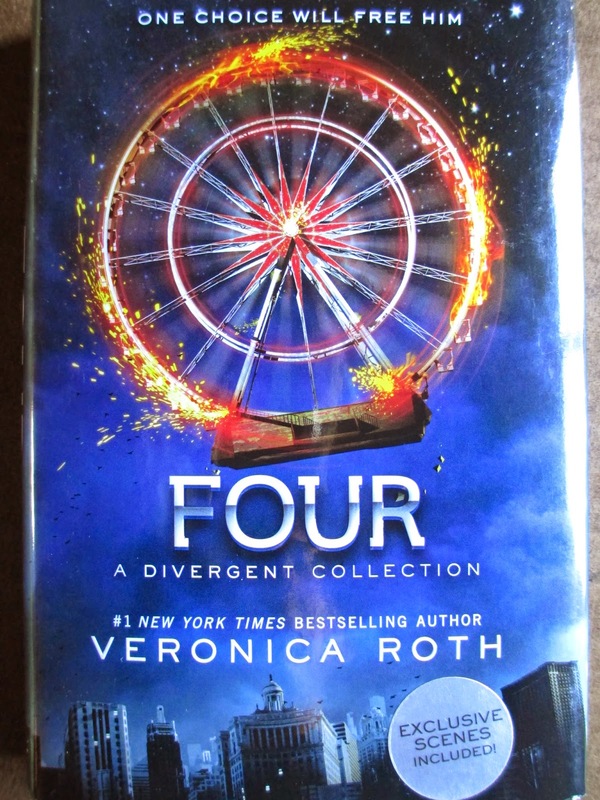 I've fallen in love with Tris and Four, in the literary sense. I want them to find happiness in their lives, but I also want to watch them get there. I want to see their journey; I want to see every emotion, every thought, every moment, every action as it happens. All of the characters brought so much to the movie that, whatever world they were in or whatever plot was going on, the story felt full. I also really cared for the way that the Divergents were portrayed. As someone who has never exactly fit in and has eventually come to value that trait because of everything else it expresses about me, I thought this portrayal was both realistic and hopeful, or bright. The inability to fall into a category doesn't mean that you're a rebel or that you're odd or that you're perfect; it just means that your mind pulls in many directions. When someone asks you what you value most, you have trouble answering--unless you answer something intangible, like family or morality. I never did like those tests you would take in school to see what category you fit into--whether you were organized or creative or compassionate: sometimes which category I'm in depends on a my mood in a single moment, so how can I choose just one? Anyway, Tris and Four are both wonderful; I don't know how they read in the book, but I loved them on the screen. Driven, courageous, brave, smart, and kind. There is such power, such power of humanity, in who they are. While I'm at it, I also appreciated that there was a love story without that being the only that is important about the story as a whole. I'll enjoy a good love story and I enjoyed this one; I just don't like every story to have that as its main and sole focus. Tris also had her family and her friends and this whole other plot going on besides just the love story. I used to say I didn't like dystopia. I felt like there is already so much sorrow in the world to go and make such a terrible fictional world as dystopia. But Divergent didn't really feel like the picture I'd had in my head of dystopia. Maybe it's because this was only the first installment in the story, the part before all the corruption in the system comes to public light. Either way, I felt like there was more than just horror and the need for rebellion and hope in absolute darkness. Just in hearing how the society works, we know it's odd, so it isn't surprising to find that there is corruption. However, this story started out on a different level: it starts with one character trying to figure out who she is and be who she wants to be. And she succeeds--that was the part about the story that I liked. I realize that there are things in this story that have been done before. But is that any reason, on its own, to not like it? When you study literature, you find that things written at the same time share many traits that only grow more and more obvious with the passage of time--but that doesn't stop you from reading them. It just enhances your reading as you figure out why certain themes or plot elements or stylistic tendencies were so commonly used; it can say a lot about the society that produced these books. And when stories are similar to each other, then the subtle differences stand out more and you can maybe even appreciate them better. If you know what kind of a plot is unfolding in a movie you're watching, that's okay as long as it's carried out well. And as I said, the characters drove this story so well for me that I didn't mind if I knew where it was all headed. I just wanted to watch them get there. V. On fiction and entertainment. It is unnecessary for something to be great art in order for it to be valuable--and sometimes the less that something is considered "great," the more valuable it is. Again, when you study literature, this is something you'll see. You'll slog through Paradise Lost and "The Wasteland" and say, wow, I'm glad those are so influential to literature but I'm so glad I'm finally finished reading them because I hated them. (Or movie-wise, you'll watch Citizen Kane and be bored despite it being "one of the best films ever.) Then you'll go back to Jane Eyre, which was just a piece of fiction and while it's still highly respected it isn't considered as much great art as other things--except by people who like it; and you'll enjoy it and connect with it in a way that you never could with "The Wasteland." You'll read random books that everyone else has forgotten just because they were part of a certain writing at the time or were popular in their day. Do you see what I'm getting at? Value in fiction is personal. If you made a connection with it, that's valuable. If many people connected with it, then that's significant. Sometimes you look up to fiction because it awed you with its brilliant delivery of form and theme. Sometimes you just really enjoyed it, and that isn't something to discredit. So there it is. I had a wonderful time with this story and I don't really want to wait until 2017 to see the end of it with the just the movies. So when I had to run into Wal-mart today for something, I picked up the first two books. And here's something entertaining: the books I'm planning to buy next time I'm in Phoenix are The Problem of Pain by C.S. Lewis, The Reason by Lacey Sturm, I Was Here by Gayle Forman, and now the last of the Divergent series by Veronica Roth. It's a wonder that I remain so thin. I never skip a meal, and here I was all morning, sitting at my desk and typing away and eating candy. I don't eat a lot of processed food, but I love candy. I also love such friends as will bring me back candy from a trip to Florida. So the candy that I have been eating and the candy that they brought me back is this Chocolate Gator and Gummi Gators box, made by Anastasia Confections in Orlando. Given that it's all candy, this isn't really a proper chocolate view--but I'm just so excited about alligator candy that I had to at least do an almost review. The thin cardboard box comes covered in clear wrap. When you lift this away, the box opens up from the top, which is a lid that can close again to let you finish the candy in as many sittings as you like. That's convenient, but what's kind of odd is that the chocolate alligator is covered in a clear plastic, form-fitting cover. Presumably it's to keep the gummy candy from melting against the chocolate--and maybe even to keep the chocolate alligator in its shape even if you leave it in a little too much sun. Practical, except when you want to start eating everything together. So I lifted up the plastic, to find that it was sealed onto a sheet of clear wrap that you have to peel away. The alligator free, I tried to rearrange the gummies all around it again. That seems like the funnest way to eat everything: chocolate and gummy gators together. Given the size of it all, it could be a fun thing to share while you're out on vacation--or to keep for yourself to eat at your desk like I'm doing. 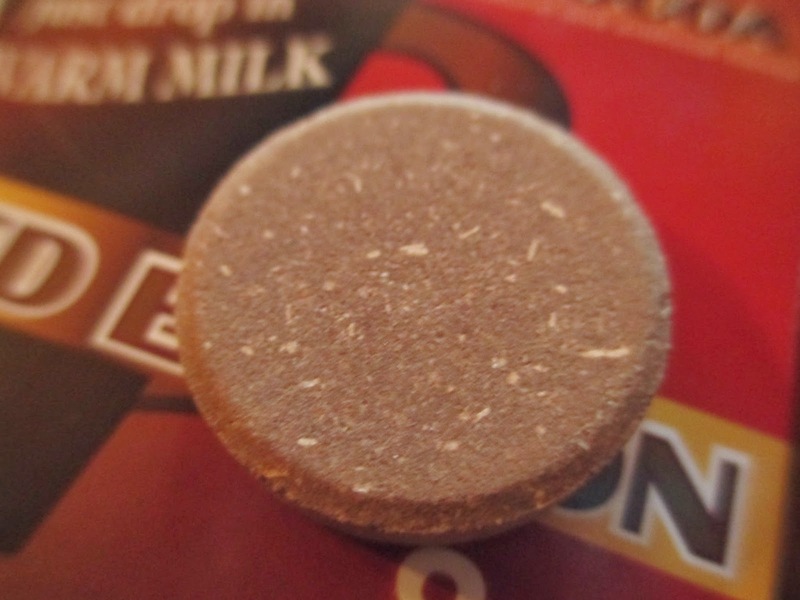 The chocolate's a little better than I was expecting, though still a pretty standard candy-level milk chocolate. Since the alligator is solid, there are no empty air spaces, which is kind of nice. And the gummy candy is also standard, though absolutely adorable. I feel like I have a beautiful present box in front of me for how excited I am. And just look at that adorable reptile, all carved in chocolate and smiling, surrounded by its green and red and yellow little buddies. I haven't been this excited over a novelty chocolate since the huge chocolate salmon from Dilettante. My precious little alligator; I think I'll adopt it as my pet--until I'm finished eating it, that is. No one in my immediate or extended family gets into the nerdy or geeky side of things. No comic books, no reading all the piles of books associated with this or that fandom, no movie books, no behind the scenes videos, no memorabilia and merch. Nothing like that, or anything else. I think the most anyone gets to is a favorite movie. I don't think there are even that many readers in my extended family . . . So you have to understand that it's all new to me, that certain ideas had never even occurred to me. When I began my rather recent declaration (say, in the last few years) that I really like Star Wars, all I had was the movies. There was nothing else related to this universe for me to grab hold of. But things had to change if I was saying out loud now that I really liked it. 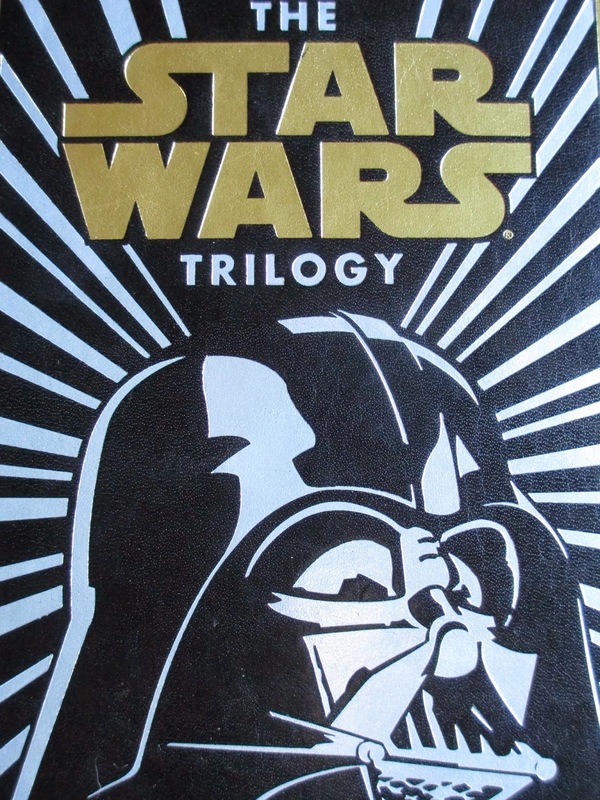 A couple of movie books materialized on my shelves, the Darth Vader dress from Her Universe in my closet, the William Shakespeare's Star Wars trilogy (which I really enjoyed), and the Barnes and Noble leather-bound classics version of the original trilogy. This was all already quite a bit more than I can picture family doing. But the thing is, that leather book just sat around looking pretty and I didn't think there was anything odd about it. After all, weren't they just novelizations of the movies? Aren't novelizations of movies usually mediocre in quality, without really offering you anything new? I didn't think I was missing out. But then I realized, maybe with the popularity of the releases of some of the new Star Wars books, that I might need to start reading at least a few of the books. I looked up the list only to find that there are way more Star Wars books than I had even pictured, probably way more than I would want to or need to read. But maybe because there were so many, I decided it was time to start somewhere, and what better than the trilogy that I already owned? I would categorize much of the novelization of A New Hope as mediocre in its written style, with bizarre, over-complicated vocabulary and too many random metaphors (including some that completely remove you from the universe of the story). However, I really enjoyed reading it. Reading me this book reminded me of all the things that I love about Star Wars. I zeroed in on Little House on the Prairie fairly early on, all on my own, without any recommendation or prior introduction from anyone. And Star Wars, A New Hope in particular, has a lot in common with the Little House series. Luke's raised as a farmer and while I've liked that bit about the story, it maybe doesn't have as much time to come across in the movie as it does in the book. Sure, most of the scenes are just what's in the movie, but there are also some extras and some longer conversations--enough to let everything soak in all over again. The farming family, the desolate planet where everyone works hard without too many results, the call to adventure. It becomes something more than adventure, of course, and that's where the Little House likenesses end. I love how much each character and each location represents, how great an impact everything has on the story as a whole. I love the deep commitment to theme. That's what I love about Star Wars. (Well, that and Tatooine.) And, you know, I think I might just break a family tradition and continue my slow delving into Star Wars the fandom, not just Star Wars the movies. Just give me some extra time, first to finish the other two books in the trilogy and then to figure out where to go from there. When I was in middle school, we would have Native American Day, where the cafeteria would serve fry bread for lunch and some of the members of the local tribe would come and tell some of their stories to us. I used to think it was sort of weird (minus the fry bread, of course), but now I've come to really appreciate that we had that day. It isn't always that schools make room for the local: history, geography, culture, etc. Maybe I used to not like the way that myths are told as facts. Whether or not people did believe myths to be facts in the past (and some still may), I think for most people myths have moved on to be symbolic rather than literal facts. They have truths even if we don't regard them as history anymore (history itself is a kind of mythology, a fact that is important not to forget--but that's another topic). And I didn't really think about that distinction, which is ironic considering that I was delving very deeply into fantasy at this time. Mythology is a lot like fantasy, in certain ways; in fact, sometimes they blur so closely that one story could easily end up in either category. Think of it this way. Tolkien wrote The Lord of the Rings to be like a mythology for his country, and it is categorized as fantasy. So what's the difference between the two, if there is a difference? It's odd because I think sometimes stories are categorized by things rather than theme or style. If they have time travel, they're sci-fi. If it takes place in the Southwest, it's a Western. If there are elves or goblins, it's fantasy. But mythology is reserved for old stories, for stories that have been a part of a culture for generations and generations until no one remembers how they first started. So a story that is written now or even vaguely recently will be fantasy and not mythology. If, however, it comes to have that greater applicability and become culturally widespread, it can, in some contexts, be considered mythology. The mythology of Superman, the mythology of The Great Gatsby, the mythology of the American West, the myth of Pocahontas and John Smith, the myth of how great Christopher Columbus was, whatever it is. These stories don't have to be true, per se, in order to be true in what they express as stories. And that's what is so easy to recognize in fantasy. You read a fairy tale and you know that it's supposed to have some sort of message or moral. You read The Lord of the Rings and you find ways that it can apply to real life. Mythology does the same thing. Sure, there are going to be plenty of individual difference, but at the center of each of these groups there is a very deep similarity. I don't know why I didn't see that when I was in middle school. It's happened slowly, and with time. I remember being in a literature class my sophomore year of college when the professor and quite a few of the students were Downton Abbey addicts. I didn't get it. I watched the first season and I didn't like it that much; I liked the second one a little more, but still not much. I was getting more interested by the third and fourth seasons and guess what? By the fifth season, I realized I was enjoying it. It's a social show. There are so many characters that the plot is their interactions with one another. Mary's relationship to her men, Edith's relationship to Mary, Robert's relationship to Bates, Carson's relationship to Mrs. Hughes, Mrs. Patmore's relationship to Daisy, and so on. It's a web--so the viewer has to be in a web, also. I started to find myself interested because I've never watched this show by myself, and when you're watching with other people you can talk and comment and give opinions and make predictions. And this show really lends itself to all of that. While, I believe, there are still two more episodes of the latest season to air on TV (in the U.S., that is), I conveniently know someone who bought the DVD set last week, so I've finished the season. I think it had everything I've come to expect and even enjoy about the show: humor, sentiment, drama, a touch of the socio-political. Wow, look what I found in a box in my closet: Fizzin' Hot Cocoa. How exciting. Good thing it still has a long way toward the expiration date, otherwise my exciting find would have been doomed for the trash, untested and undiscovered. As you can tell by the ribbon on the box, it was intended as a Christmas item. 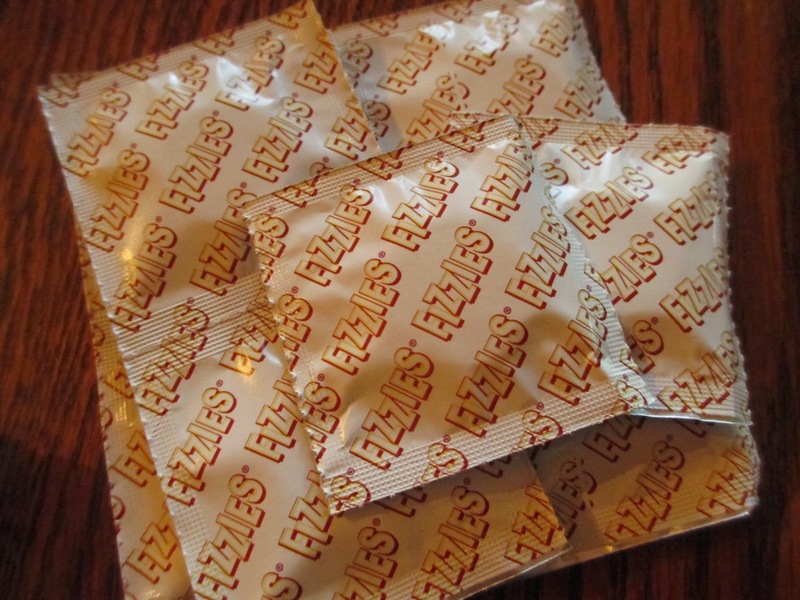 Perhaps because of the Christmas possibilities, there are eight individual packets inside. You can have a party for eight people or tear the packets apart and put them in stockings--there are instructions on the back of each one. They're quite simple, after all: drop one tablet into 3/4 cup of warm milk and wait until fully dissolved, about five minutes. Seems simple enough. And the idea of fizzing hot chocolate, well, that is sort of intriguing. At three dollars for the box, it was worth trying. The tablets are like giant, brown Smarties. They're flavored with both natural and artificial chocolate, and, of course, are sweetened with other products besides sugar. Let's move right along and get away from icky pictures of ingredients. My flowered teacup is just the right size for a 3/4 cup serving of hot chocolate, but I suspected that the fizz from this particular kind might take up more space. I was right--but I didn't use a different cup. After dropping in the tablet, I tried to get some hasty pictures of the process. Foaming fizz develops right away and it quickly overflowed my teacup; I was worried that it might also overflow the saucer, though it never did. Perhaps this type of thing isn't the company's responsibility (after all, I knew this cup was too small), but mightn't it be nice if they included a caution to use a large mug? The first few seconds were exciting. Then it was terrifying. What is this mass of foamy, hot fizz that I'm expected to drink? It's even more terrifying once you dare to take a sip. It tastes like standard powdered hot chocolate, plus a weird flavor that's designed to imitate the taste of carbonation in soda. After all, this isn't exactly carbonated hot chocolate: it's fizzy hot chocolate. 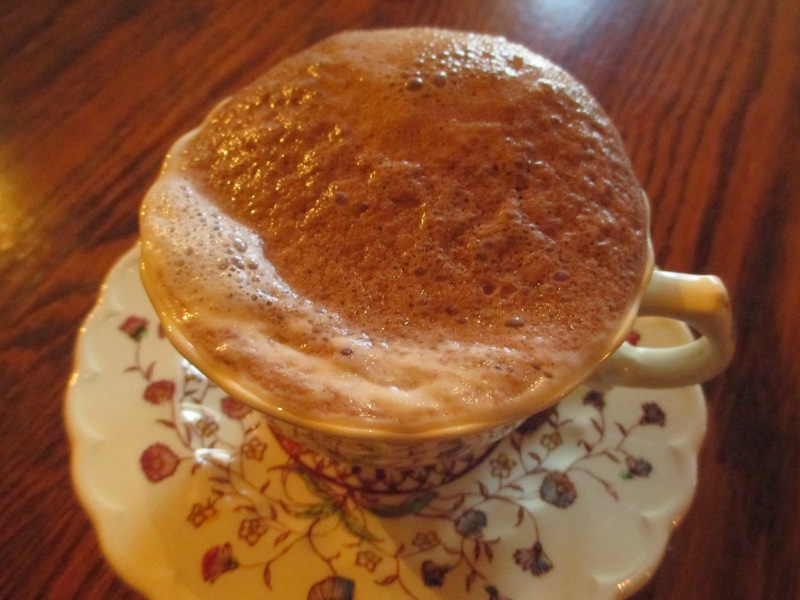 It's like a quirky twist on foamy hot chocolate. I prefer, a thousand times, to drink hot chocolate that's been stirred with a milk frother. You get the foam without any other weird tastes, even if it takes an extra step to get there. This hot chocolate tastes terrible. Granted, I don't really drink soda and I don't eat a lot of highly processed, sweet products, so maybe I'm exaggerating the average opinion. But still. What happens with this drink is that the foam arises above a pretty standard hot chocolate. So with each sip, you get some of that foam and some of the regular liquid. 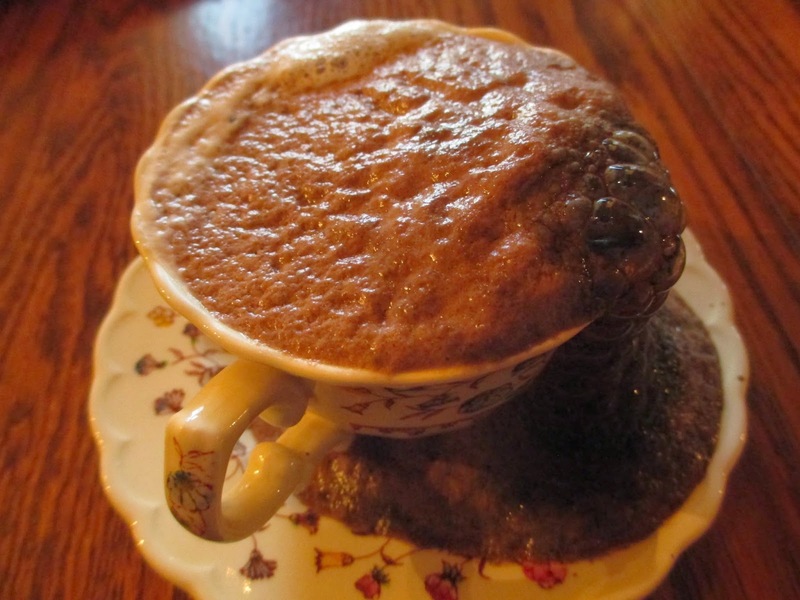 The foam quickly becomes a frightening mix of brown and white color, and if you let it set for another minute, the foam will dissipate entirely and you're left with nothing but a messy rim on your cup and an ill-tasting hot chocolate. It's fun as a novelty product, I suppose, though I don't see who would want to drink it. It probably has the most appeal for ten year olds (or the ten year old moment in us all) who just want to watch a tablet turn milk into brown foam. I don't even feel like using the other seven tablets.